Okay, let's talk face wash. The truth of the matter is that while it's essential (it keeps our skin clean and the makeup off our pillowcase), it's annoying. Unlike moisturizers, masks, and serums, which all have a kind of luxurious and ritualistic feel to them, slathering cleanser all over our face is a 15-second experience maximum, feels like the ask of the century after a night out with too many tequilas, and, perhaps worst of all, leaves us with water dripping down our forearms. It's just not the most enjoyable step come nighttime skin prep. Alas, as we said, face wash plays a vital part in priming our skin for our other (more exciting) products and treatments and ensures our pores remain clean and our blemishes banned. That said, since face wash is, indeed, the most fleeting step in our skincare routine and circles the drain instead of soaking into our face, it's just not worth spending an arm, leg, and hefty portion of our paycheck on. In fact, there are countless drugstore face wash formulas that are just as effective at nixing dead cells and any aftermath of makeup—many of which specifically cater to different skin types. We did you the favor of perusing the face wash selection of a few of our favorite affordable beauty retailers (think Ulta, Walmart, and Amazon) to pick the best-of-the-best formulas we either use ourselves or would personally recommend to a friend. Keep scrolling for 15 drugstore picks that made our cut. Every beauty editor loves this cult-loved French drugstore brand. And while its basic micellar water is probably its most iconic formula, we recommend this special formula for those with oil-prone skin types. We love the feel of the gel-to-foam formula and have a special appreciation for the brand's Fluidactiv Sebo-correcting complex, which keeps sebum levels in check alongside other strategic purifying picks like zinc and copper sulfates. Time and time again, top dermatologists (who, ahem, do have access to all the best and most expensive products in the industry) have recommended this budget-friendly cleanser for those with sensitive skin woes. It leaves skin feeling fresh and soft, and is free of all dyes, fragrances, and other potential irritants. This naturally-powered face wash is a dream for all skin types and is 100% vegan and cruelty-free. Plus, it's also enriched with a bunch of other glow boosters like coconut water, papaya extract, and sea vegetables to up your daily hit of antioxidants. If you feel dry and sensitive, this is one of our favorite drugstore face washes to soothe an aggravated complexion. It helps calm irritation and redness and helps easily remove dirt and oil without throwing your skin's natural hydration levels out of whack. Soothing feverfew and nourishing oat are the two all-star ingredients. Equally great for both combination and oily skin types, this acid-infused cleanser from drugstore fave brand Vichy is a game changer thanks to a hard-hitting mix of LHA, glycolic acid, and salicylic acid. And it's easy enough on your skin for everyday use. Truth be told, we hadn't heard of this under-the-radar face wash until one day we noticed it had an almost perfect five-star rating at Ulta. It's affordable at just $13 and boasts a unique ingredient strategy (think pore-cleansing free range fertilized egg extract) to leave skin purged of clogging oils, grease, and debris. I first discovered this French drugstore staple via my 72-year old mom (who has delicate, sensitive skin), and I've been recommending it to friends and co-workers as a wallet-friendly face wash alternative ever since. It's enriched with thermal water, ceramides, brightening niacinamide, and hydrating glycerin. Less than $10 and bursting with hydrating hyaluronic acid (a must for dry skin! ), this is one of the best moisturizing face washes we've tried from the drugstore. It's proven to boost the skin hydration levels and also gets rid of makeup and other inevitable impurities in one fell swoop. Formulated with nice-for-the-skin things like bamboo buffers (for necessary exfoliation) and flower botanicals to soothe and replenish the skin, this multi-tasking cleanser is free of oil and a top recommendation if you're a combo of oily and dry. Tea tree oil is nature's heaven-scent antidote for those who struggle with excess oil and/or annoying cycles of breakouts. And it's this soothing face wash's starring ingredient. Free of oils, fragrances, soaps, and other potentially irritating ingredients, this $5 face wash is great for removing dirt and makeup effortlessly. Plus, the luxe foaming lather just feels really damn nice at the end of the long day. This ultra-gentle face wash is great for those who fall into the normal or oily skin type categories. The ingredient list has a basic, no-frills-attached strategy, which leaves skin feeling hydrated, clean, and balanced. Even top dermatologists (who we love peppering with drugstore product questions) love this affordable, yet effective face wash. 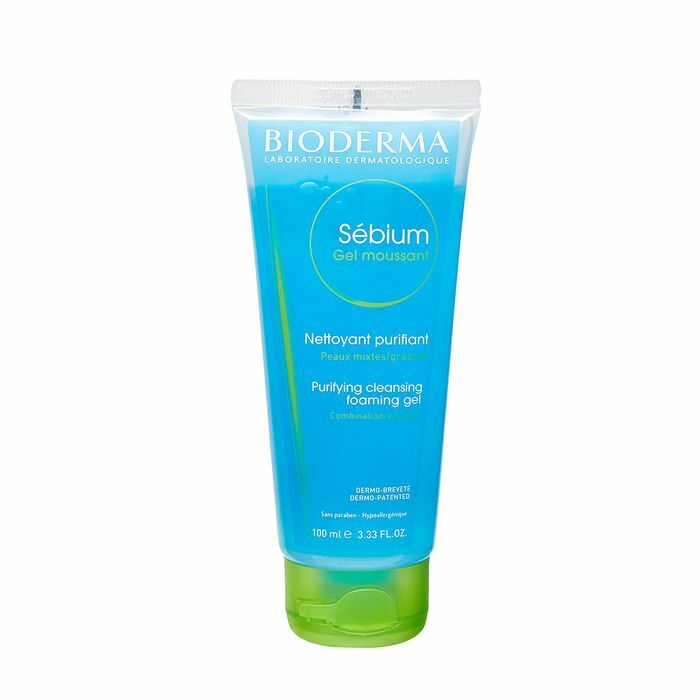 It's specifically formulated for parched, dehydrated skin and features key players like ceramides and hyaluronic acid to infuse the complexion with a needed surge of moisture. This best-selling face wash plays nicely for normal, oily, and combination skin types who battle the occasional bout of oil with the inevitable consequence of blemishes. Benzoyl peroxide is the strategic addition used in this daily drugstore face wash in order to help remove oil and dirt while simultaneously treating and discouraging breakouts.